Everyone's hair, at some stage turns gray. Some gray at a young age while others later on. The graying process is a slow and gradual one. The gray streak is the most unwelcome sign. The first streaks normally appear at the sides or the temples. Hair types, textures, genetics, and even stress affect the color of hair. Gray hair indicates a deficiency in some part of the body. 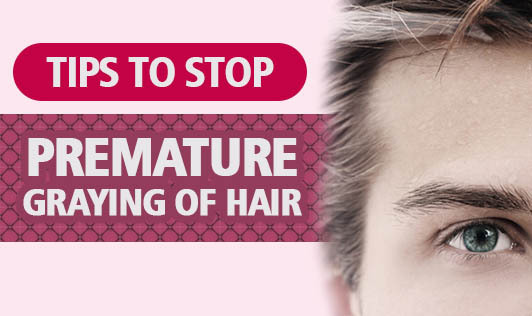 Plucking gray hair does not deter their growth. The graying process can be arrested with proper treatment and diet. Supplements of copper, folic acid, and B-complex can restore color and curb hair loss in some people. 1. A strong decoction of black tea and one tablespoon of table salt. Strain and apply to roots for forty five minutes. When using this decoction, avoid using shampoo. 2. A ground paste made from curry leaves and sour buttermilk. Apply on scalp for fifteen minutes. Wash off with tepid water. Use this once a week.